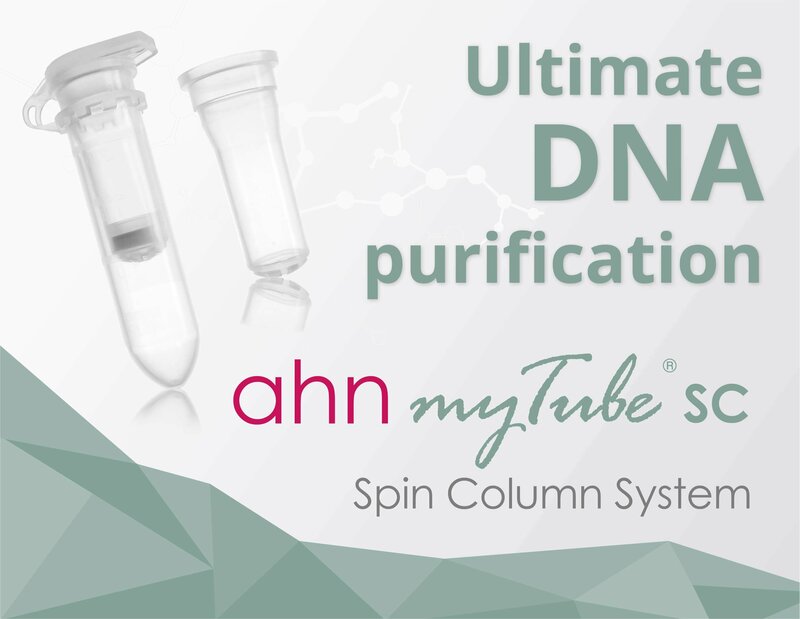 AHN myTube® spin columns for DNA purification provide solid phase purification, designed with the end user in mind and it is well optimised to make laboratory work both quick and simple. Due to the vast scope of applications, the unique applications of myTube® spin columns are best outlined by describing the properties and use cases of the various filters that are supplied for the kits. Below provides an overview of the spin columns for DNA purification. Glass fibre filters feature a rapid flow rate and high particle loading capacity. These are our recommended spin columns for DNA purification (both genomic DNA and plasmid DNA as well as RNA). Thanks to the combination of myTube® spin columns and glass fibre filters, this type of spin columns for DNA purification can retain nucleic acid samples with minimal loss, while concomitantly removing salts and small molecules with an efficiency of up to 99.99%. This results in high sample yields and reproducible results for downstream processes such as cloning, PCR, transformation, restriction digestion and sequencing. AHN myTube® spin columns for DNA purification may also be used when prefiltration is required as is the case for very dirty solutions. This extra step makes quick work of the final filtration process. The results yielded from these filters are dependent on the use of appropriately formulated lysis, washing and elution solutions. We recommend optimising your protocol for the best results. AHN myTube® spin columns for DNA purification with polyethylene filters are supplied with 20-60 µm pores and are suitable for coarse filtration with the aim of particle removal. These spin columns for DNA purification can be used both as a prefiltration step, to lower particulates, and as a support filter in combination with the other filters. Polyethylene filters are hydrophobic, temperature stable and have very good chemical resistance. The filters can withstand concentrated acids, alkalis and a variety of organic solvents.